Here’s a picture of a new crop-circle advert for Papa Johns pizza somewhere in Colorado. I’m a sucker for these things. It’s partly the scale, partly the fact its nature made un-natural. It’s also the way these things seem to splice aspects of the crop circle fad of the late 1980s and early 90s which spawned UFO conspiracy theories with the nobody-knows-who-they-were-or-what-they-was-doing-there chalk figures such as the Cerne Abbas giant and the Uffington White Horse via the cheap-advertising-turned-tourist-destination of the Hollywood sign. This mixture of extra-terrestrial hoax, mysterious primitive art, modern agriculture and communication makes you suddenly look at landscape in a different way: that landscape becomes a medium. It suggests that the earth might be a sphere of information floating in space, its surface a document rather than geology. And at certain moments: flying over the geometry of Holland’s landscape, or driving under the M25 on the M4 and seeing the symmetrical looping patterns of motorway on the screen of a sat-nav, landscape seems to click into a different mode. These are moments which have a quality that if discovered by future civilizations would look as though they meant something. There’s a difference between things that feel like they should have meaning (even if they don’t) and things that have explicit information as content. 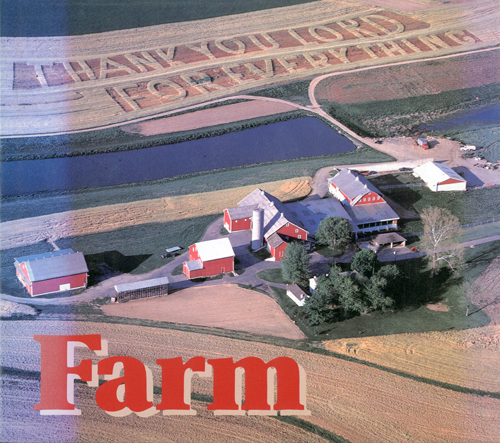 I bought this very dull book on American farming just to get its fantastic cover – in which a farmer has cut a message into his field as a way of sending a message to a God who, one imagines the farmer pictures looking down from a cloud. 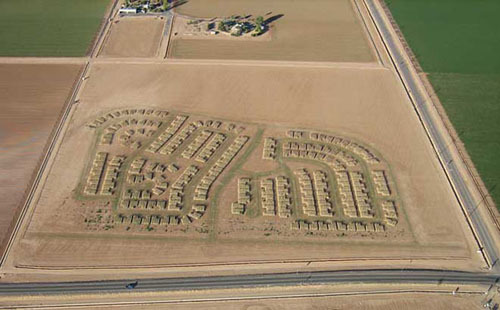 This artwork by Matthew Moore (see this earlier post) explores the different potential ideas of landscape through crop-art by carving the plan of a proposed suburban subdivision into its agricultural present.